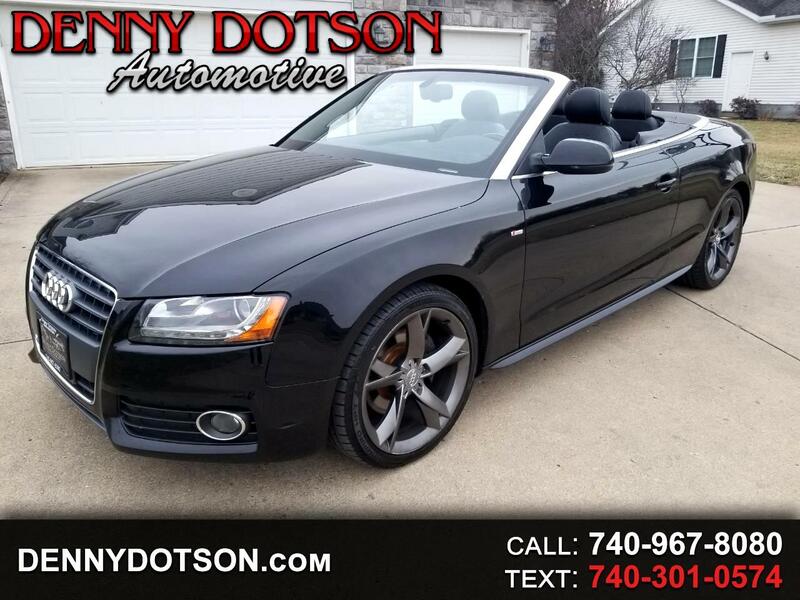 Used 2010 Audi A5 2dr Cabriolet Auto quattro Prestige for Sale in Johnstown OH 43031 Denny Dotson Automotive Inc.
What a good looking convertible Audi A5!! Brilliant Black over Black w/Leather/Alcantara Seating. 2 owner Prestige(Audi Music Interface w/iPod Cable, Bluetooth(R)/Homelink Package, Heated Front Seats, LED Daytime Running Lamps, LED Tail Lamps, Three Zone Climate Control, Xenon Plus Headlights, Rain Sensor, Light Sensor, Audi Music Interface w/iPod Cable, Bluetooth(R)/Homelink Package, DVD Player, Advanced Key Keyless Start/Stop, Autodimming Interior Mirror w/Compass, Auto Dimming Exterior Mirrors, Bang & Olufsen Premium Sound System, Color Driver Information System, Memory For Driver Seat & Mirrors, Navigation Plus System w/3G MMI), S Line Package(Includes black headliner, S Line badges on fenders, S Line bumpers and side rocker moldings and S Line door sill inlays, Side Assist Lane Change Assistant, Headroom Heater, Perforated Genuine Milano Leather Upholstery, Wheels: 8.5J x 19" 5-Y-Spoke Alloy, Brushed Aluminum Interior Trim, Exhaust Tips, Front Sport Seats, Leather/Alcantara Seating Surfaces, S Line Steering Wheel, Sport Suspension) Bluetooth(R)/Homelink Package, Shift Paddles For Steering Wheel, Sport Suspension, Adaptive Suspension Damping System.